These are items that I love and trust on my dry skin and other skin issues which have natural or organic ingredients!! 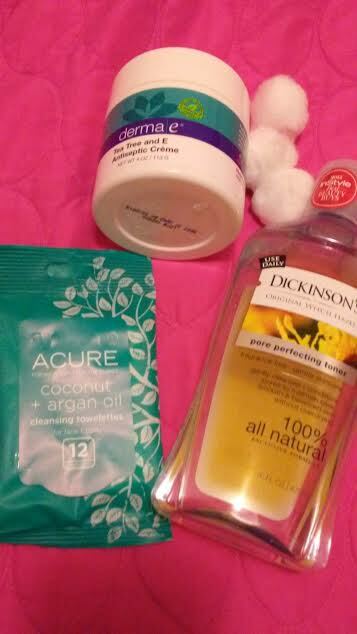 I love using Acure Coconut and Argan Oil wipes for a quick and moisturizing refresher for my face and body plus these are great for my son, too! I love Dickinson's Witch Hazel Toner (not astringent !!) which is perfect for my dry skin for before or after cleansing and for getting makeup participle left behind by my cleanser and makeup remover!! And I am a big fan of Derma e skincare products which is great for my skin including moisturizing cream with Tea Tree and Vitamin E which is great for my skin blemishes and dryness! Most of these items and their brands I love and trusted for my dry skin and skincare issues which offer natural or organic results! !